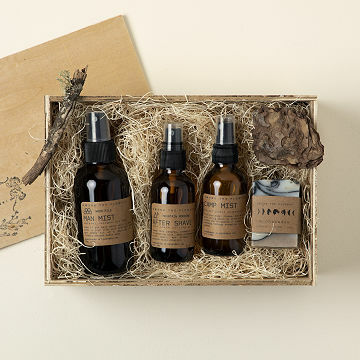 This woodsy grooming kit offers a bounty of great-smelling goods for manly grooming. In their natural habitat, wild men only need a mountain stream to scrub in and a spruce branch to comb their beards. For more civilized guys, this woodsy grooming kit offers a bounty of great-smelling goods. Bod Butter is a moisturizing, post-shower blend of herbal oils and whipped shea butter with a foresty fir scent. Mountain Morning aftershave is a soothing and bacteria-fighting morning ritual for smooth, hydrated skin after shaving. Man Mist cologne captures the essence of the deep woods, fresh-cut lumber, and trailblazing masculinity. Moonshadow cold-processed soap is handcrafted and completely natural, but ready to deliver a deep clean. Presented in a rustic wood crate with moss and dried botanicals, it makes a great gift for any rugged guy who cleans up nicely. Handmade by Megan Taber in California. In box: 9" L x 6" W x 3" H; Bod Butter; 4oz., After Shave 2oz., Man Mist 4oz. He said it smelled great and left my skin feeling soft. Want my entire house to smell like this stuff! Smells amazing, natural, subtle wood and green notes, packaged really well, perfect gift for the 'wild man' in your life wether he's 15 or 53. Wild Man Grooming Kit for a Wild Man! I was perfect for my green, off the grid, environmental, one with nature sibling.